This is a marvelous cookie! 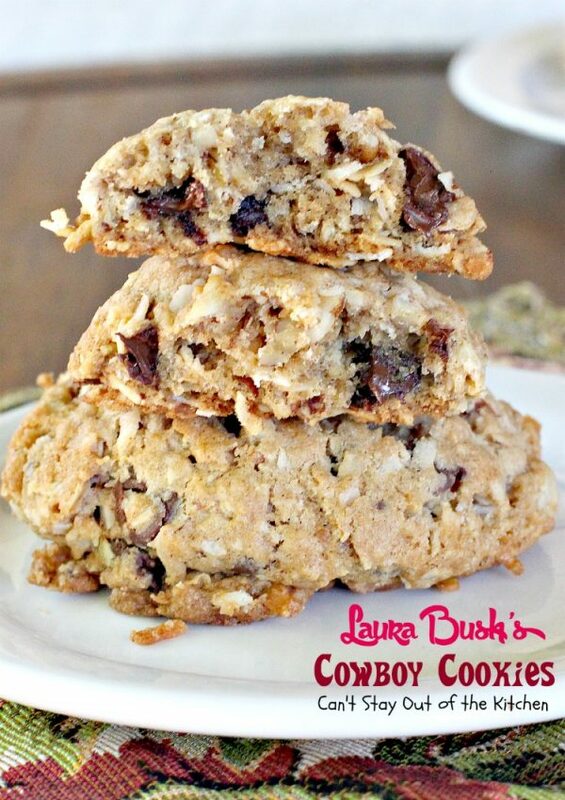 Laura Bush’s Cowboy Cookies are loaded with pecans, coconut, chocolate chips, oatmeal, and flavored with cinnamon. We have made this tasty cookie several times for our Christmas baking extravaganza when we bake 2,500 to 5,000 cookies (usually over a 3-day period) for friends, family, co-workers, church members, seminary staff, neighbors, and doctors and others we want to bless with a batch of Christmas cookies. And, yes, we are usually exhausted when it is all over! This recipe was given to me by a co-worker, Bettie Raye, when we worked together in the Financial Aid office at Dallas Baptist University. Mrs. Bush submitted these cookies to Family Circle magazine back in 2000 during the presidential campaign for a presidential bake-off with Tipper Gore. The Fort Worth Star-Tribune carried this recipe in 2001. The Washington Post carried this recipe in 2005. We love these cookies. I think they are supposed to be baked in really large sizes so I used a large cookie scoop for mine. 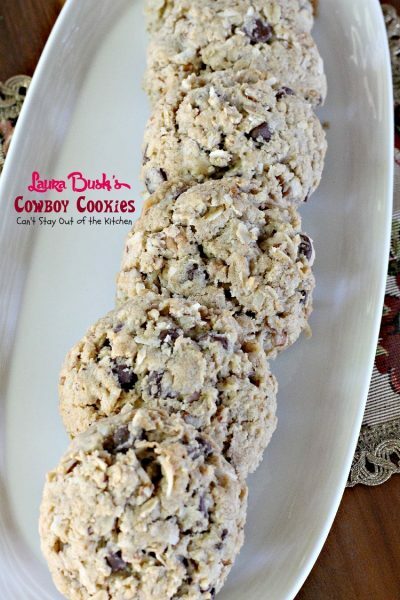 Laura Bush’s Cowboy Cookies is a great recipe to include for your holiday baking, but it is also one that can be made all year round since the ingredients are always available. 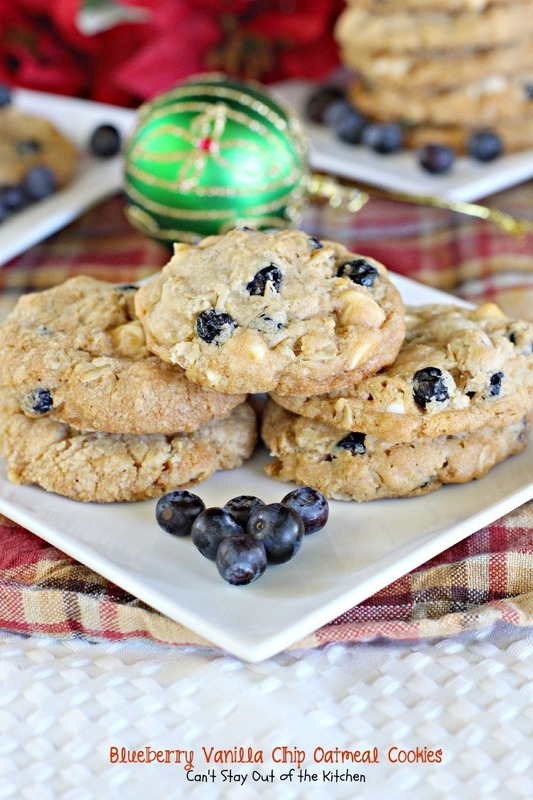 You may want to try this delicious cookie recipe soon! 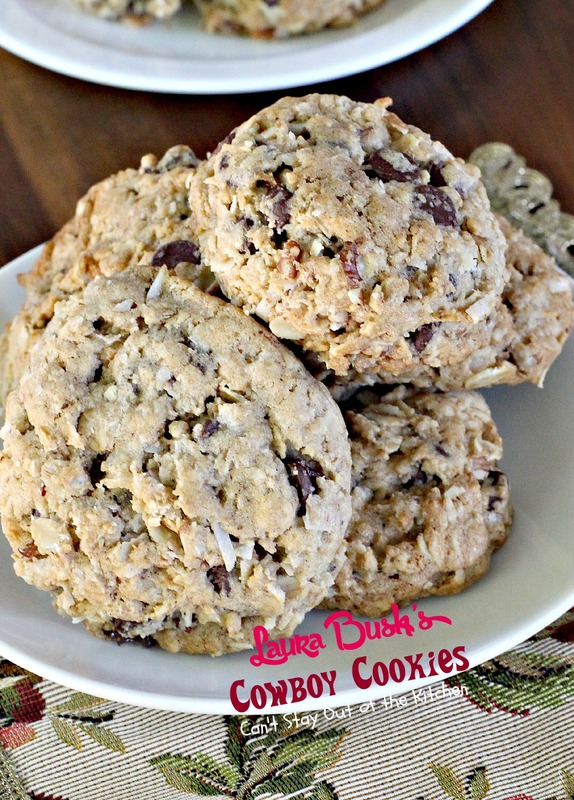 I am grateful for the former first lady sharing this marvelous cookie recipe. 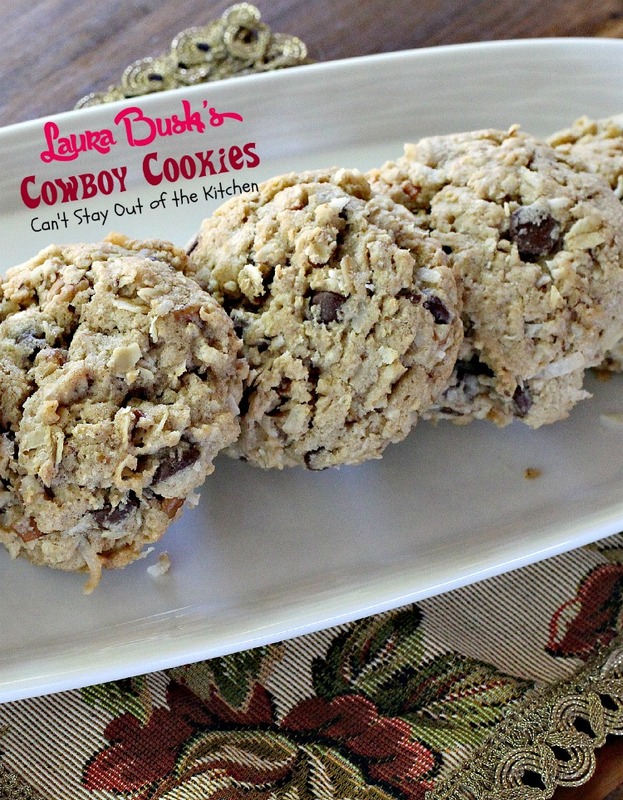 Laura Bush’s Cowboy Cookies is a featured recipe at Recipe Lion. You can find the recipe here. When I initially posted this recipe in November 2012, I was still using an iPhone 3 for a camera since it was the first year of my food blog. After the first year I began using a Canon so the pictures became decidedly better. As a result, I’ve been going back through all those first year recipes and remaking them so I can retake the pictures. I made these cookies (June 2015) for a youth swim party at our house last month. They were eaten like hot cakes! Here’s a look at Laura Bush’s Cowboy Cookies. This is one terrific cookie! 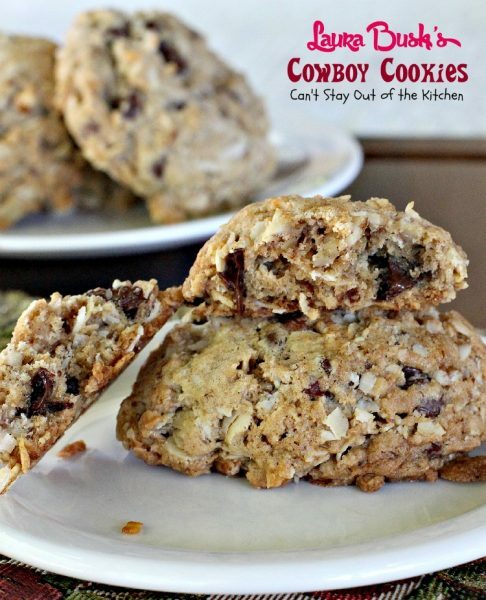 These amazing cookies are filled with chocolate chips, pecans, oatmeal and coconut. The taste and texture of Laura Bush’s Cowboy Cookies is wonderful. 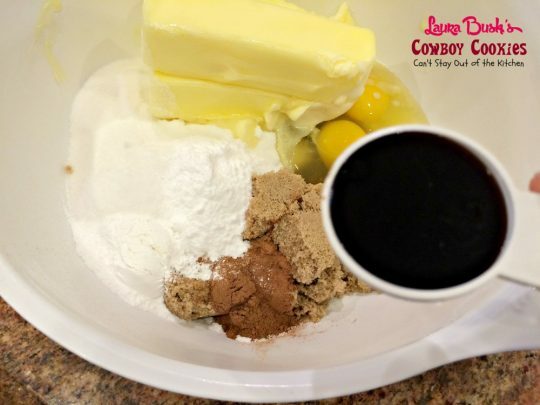 Put softened butter in a mixing bowl. Add sugar, brown sugar, eggs, vanilla, cinnamon, baking powder, baking soda, and salt. Mix all ingredients together with an electric mixer. Add UNBLEACHED all-purpose flour. Bleached flour toughens baked goods. 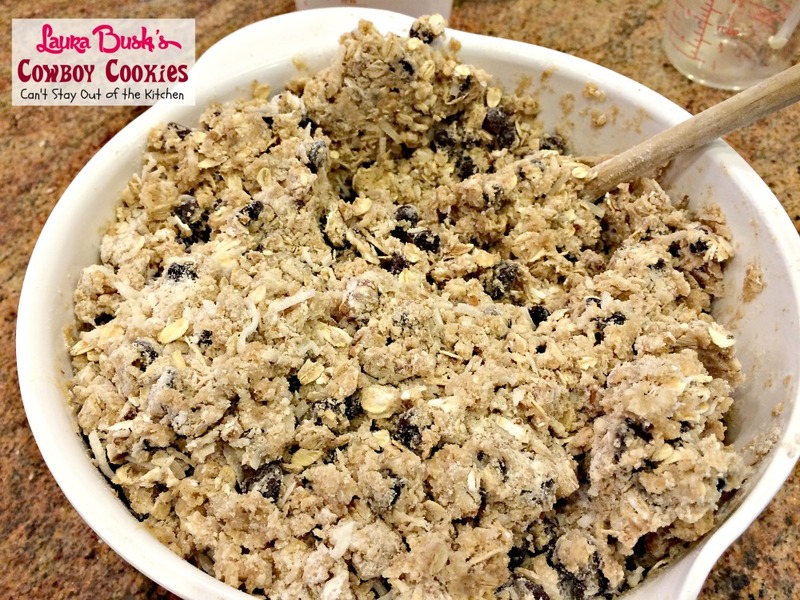 Add oatmeal, chocolate chips, coconut and chopped pecans. Scoop dough with a cookie scoop. Set balls on cookie sheets that have been sprayed with cooking spray. Bake in 350 oven 17-20 minutes or until edges are lightly browned. Laura Bush’s Cowboy Cookies are always a crowd pleaser! Here’s a heap of these fantastic cookies. Laura Bush's lovely oatmeal cookies with chocolate chips, coconut and pecans. 2 cups chopped pecans 8-oz. Mix sugars, butter, eggs, vanilla, salt, baking powder, baking soda and cinnamon with an electric mixer until well combined. 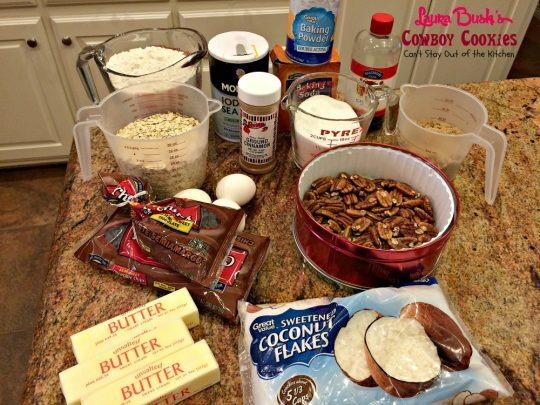 Stir in flour, chocolate chips, oats, coconut and pecans with a wooden spoon. 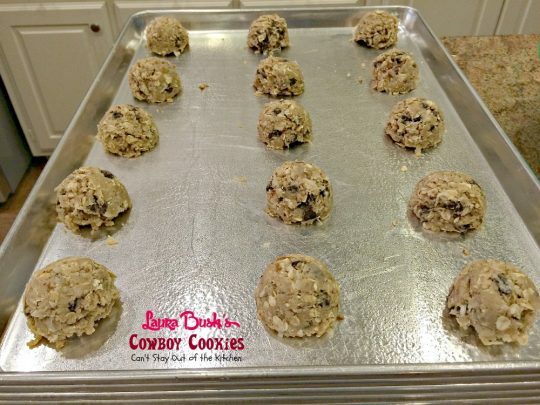 For each cookie, drop ¼ cup of dough onto cookie sheet sprayed with cooking spray, spacing 3 inches apart. Bake 17-20 minutes, until edges are lightly browned. 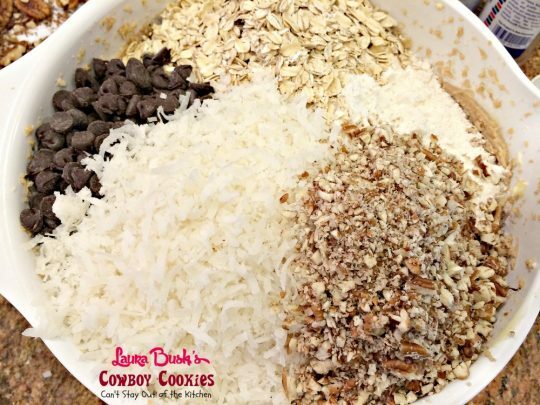 NOTE: You will need a very large bowl to mix the ingredients. NOTE: You can also use a large ice cream scoop portion out the cookie dough. NOTE: If you don't prefer a strong cinnamon taste, cut the amount from one tablespoon to one teaspoon. NOTE: If you make the cookies smaller, they may tend to become too hard after baking. They need to be made large so they don't toughen. NOTE: If your oven runs hot, you may want to dial back the temperature so these cookies raise properly while baking. Otherwise, they will cook too quickly before the cookies have had a chance to rise, resulting in tougher cookies. Recipe adapted from Family Circle Presidential Bake-Off Recipes. 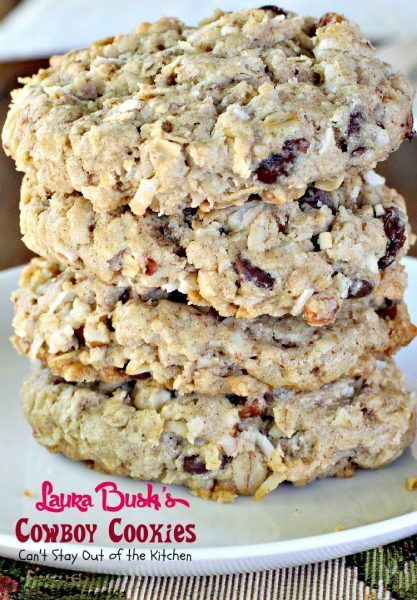 Laura Bush’s lovely oatmeal cookies with chocolate chips, coconut and pecans. You will need a very large bowl to mix the ingredients. [br][br]You can also use a large ice cream scoop portion out the cookie dough. [br][br]If you don’t prefer a strong cinnamon taste, cut the amount from one tablespoon to one teaspoon. [br][br]If you use a bleached flour you may need to use a full 3 1/2 cups flour. 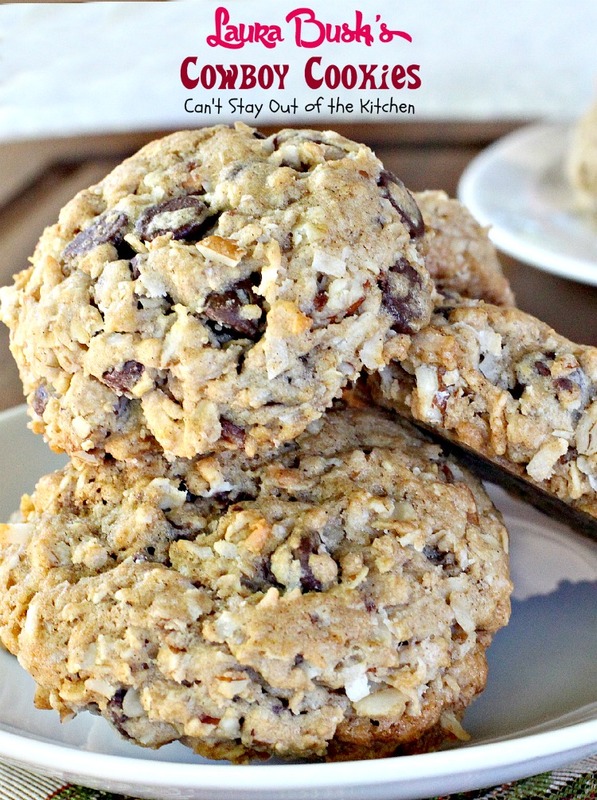 Chocolate chips, oatmeal, coconut and pecans work so well together in this cookie. Laura Bush’s Cowboy Cookies are scrumptious treats that are great for holiday baking, office parties, or anytime you want a tasty dessert. These cookies have great crunch with the oatmeal, pecans and coconut, and then add the taste of softened chocolate chips and you have one marvelous cookie. Made these today, made a huge batch of cookies, however they are hard, taste ok but are hard as a rock, I have no idea what went wrong! Betty Ann, Two suggestions. If you have a hot oven it cooks the cookies too quickly. It doesn’t allow the process of rising and falling for the cookies to soften. Also, these cookies must be made very large. If they’re made smaller they will overcook at 17-20 minutes. Thank you, I do think the oven temp may be off. I did make them larger than most other cookies. I did put them in a container with a slice of bread and they did soften up. Hi, Betty Ann. I thought of one more thing. When I bake this type of cookie, I usually have to take it out of the oven just before it is done. Right after it hits the peak rise and just barely after the last of the liquid part goes from shiny to dull (because it’s finally cooked), but before the cookie has actually set. I know it sounds trivial, but taking them out of the oven about a minute or two before they’re done and allowing the cookies to finish baking in the pans are what usually works for me. I hope you give it a try that way (plus reducing the temperature to about 325) and see if that works better for you. Perhaps, cutting the recipe in half or a fourth just to give it a try. Can this recipe be used to make bar cookies rather than drop cookies? If so, how would the baking time change? Hi, Lisa. I’m sure you could easily do that. Since this is a large amount, you probably need a cookie sheet of about 18×26″. If you don’t have one that size you may have to use a couple of smaller cookie sheets. For the large cookie sheet, you will probably need to start checking for doneness at around the 30 minute mark. They may take as long as 45 minutes. Wait until a toothpick inserted in center comes out clean. 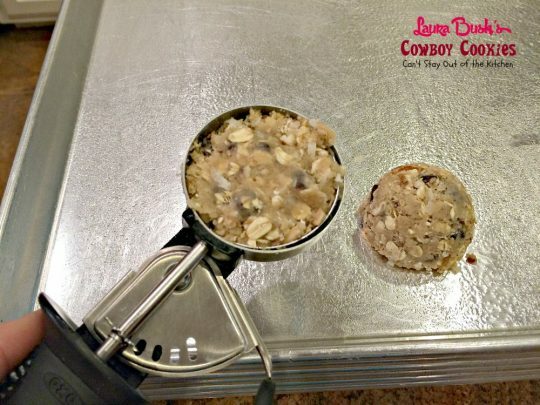 For smaller cookie sheets, you may want to start checking around the 20-25 minute time frame. Hope this helps. Very much so! Thank you! Wow these cookies were 😋😋😍👍🏼 So delicious!! I knew they were going to make a lot but I didn’t realize how much 😂 so I got to share them with lots of people which is always a great thing! Thanks for the recipe, it’s a keeper!! Hi, Peyton. So glad you enjoyed the recipe and had enough to share. 🙂 Thanks for stopping by and letting me know. Have a great weekend. Do you have to use old fashion oats or can you use quick oats?? Hi, Nina. 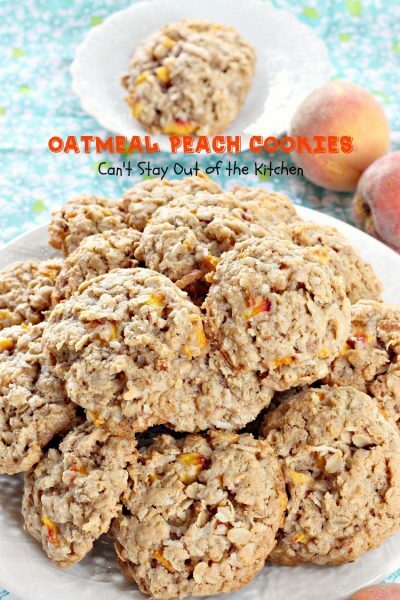 You can use any kind of oats. I just like the texture better of the old fashioned oats. My Mom has made these cookies for as long as I can remember. I tried them last night on my own for the first time and they flattened out. How do I fix this. Hi Mechele. Some of that is the flour you use. I would recommend adding a little more flour to the recipe – about 1/4 cup to 1/2 cup should do the trick. If you don’t want to add additional flour you can also roll the dough into balls and then refrigerate the dough for about an hour before baking. That will help the cookies hold their shape. 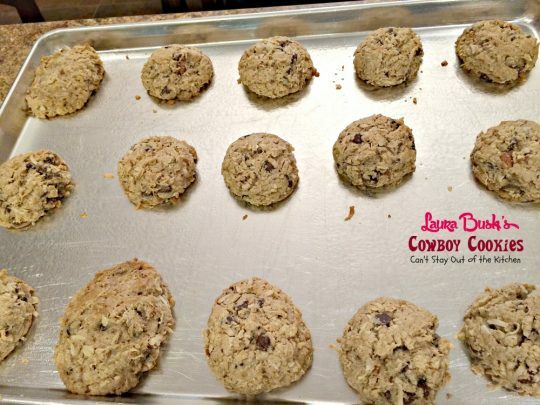 In the picture it says use a cookie scooper but in the recipe notes it says use a ice cream scooper which is much larger.i have a cookie scooper so do I still bake them for the same time? Hi Destiny. I actually use a one-quarter cup scoop. I can use it for cookies or ice cream. Sorry for the confusion. You may need to bake them shorter or longer depending on your oven and the actual size of your scoop. my husband does not like coconut. if i leave it out do you recommend a replacement or another modification? Hi, Karen, I’ve heard of some folks using grape nuts as a substitute. I think I would try it without the coconut first. Then if you don’t like it that way, add grape nuts or some kind of dried fruit like raisins, craisins, apricots or something like that. You may have to increase the flour if the recipe is too gooey without the coconut. I’d bake one cookie to see how it turns out and if it runs flat and doesn’t do well, try adding a little additional flour and bake that way. I just made these cookies for my husband’s VFW meeting. I think the Vets will like them. They are delicious and I will make them again. Lots of good ingredients that I like. They are a hefty cookie so I can only eat a few. I knew it was going to be a big batch but this is huge. I guess everything is bigger in Texas! Some will be going in the freezer to enjoy later on. The recipe was easy to make too doesn’t use alot of ingredients!!!! GREAT TREAT? Yes, they really are terrific cookies, Vera. Thanks for stopping by. I think these cookies would have been excellent using less cinnamon. One tablespoon seemed excessive but I followed the recipe. It overpowered the rest of the ingredients. Perhaps one teaspoon? Hi, Patty. I’m sorry you didn’t like the cinnamon taste in the cookie. One tablespoon cinnamon is what Laura Bush’s recipe called for so I kept it the same. By all means, feel free to cut it down to one teaspoon if that’s better for you and your family. Hi, Teresa, you can use margarine in the recipe, though it may change the texture and taste slightly. Thanks for stopping by. How many cookies does this make and should you chill the dough? Veronica, this makes 36 large cookies. 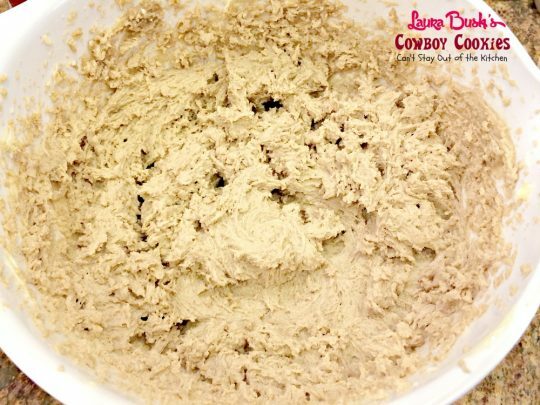 I don’t recall ever chilling the dough except during the holidays when I’m making up 5-10 batches of this cookie at a time and I put it in the refrigerator overnight for the next day. Can I freeze these once theyre baked? Hi, Andria. Absolutely. I freeze cookies all the time and I’ve frozen these ones before too. These cookies look so good!! I can’t wait to taste them but I have a question. How do I judge how much flour to use? It says 3 to 3 1/2 cups. Thanks!! Patti, If the mixture seems a little gooey at 3 cups, add an additional half cup. That way the cookies won’t flatten out too much while you bake them. (I always go with more rather than less flour). Hope that helps. Thank you!!!! I didn’t know that! Thanks to all for info. Regards Judith Piggott. Hi , I am emailing you from New-Zealand so hope that you can reply. 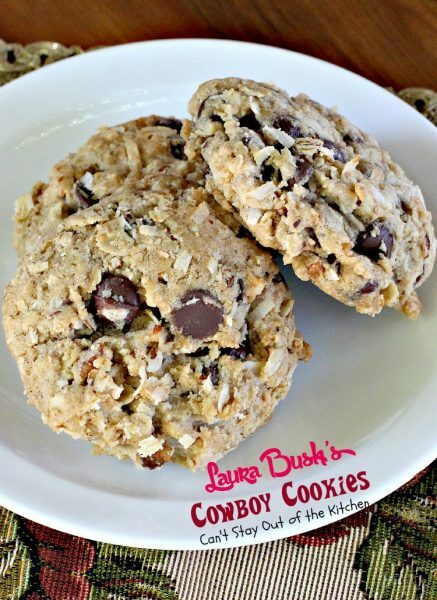 I want to make these delicious Laura Bush cookies but could you tell me how much is a stick of butter is. We use ounces or grams. I am making a guess that it would be 3 ounces. Thanks for the wonderful recipes on your site. Looking forward to more Regards Judy . A stick of butter is 4 oz. Hey Judy, 2 sticks equal 1 cup or 8 ounces. 1 stick equals 4 ounces. 4 sticks equal 2 cups and weigh one pound. I hope that helps. 1 Stick of butter equals 8 tablespoons or 8 ozs. Good luck. Each (one) stick of margarine or butter equal = 1/4 cup, or 4 oz. Hi, Elaine. Each stick of butter equals 8 tablespoons or 4 ounces, but that is equivalent to 1/2 cup. 2 sticks = 1 cup, 4 sticks or a 1-lb. package = 2 cups. Thanks. We have been doing it almost 35 years! It started out as gifts for family one of the first years we were married because we couldn’t afford anything else. I probably only made 3 or 4 batches of cookies back then! Hi !This looks incredible as usual! Thank you so much. Appreciate your kind comments. You’re welcome. I love making cookies. There will be a lot more before the year is over! This looks like a wonderful recipe. I read Laura Bush’s biography and she said that “it is better if I don’t cook!” I thought this was funny and remember it. Someone said someone cooks for them. But maybe she used to make cookies. Anyway, they look great. Yeah, she submitted these to Family Circle in 2000 for a presidential campaign bake off with Tipper Gore. They really are delicious.